This is the name of not only a pen, but also a filler. At the beginning of the 1930s, Parker was feeling some of the pinch of the Great Depression, and like most other manufacturers was casting about for ways to drum up more sales. Consumers have ever been suckers for innovation, and at about this time Parker was handed an innovation by Arthur Dahlberg, a professor of machine design at the University of Wisconsin. He’d been working up the design for a new pen-filler for some years, but had run out of money (and likely patience) for it. Parker bought the patent from him and spent a further $125,000 on getting it to work properly– that sounds like big money to spend on a pen component even today, but consider that translating that amount to current terms means they dropped what we’d perceive as almost two million dollars into the project. Isn’t it a good thing it bore fruit? The way ink entered into the pen using this filler was no different from a bulb filler, as I go into on the page dealing with that filler. Where the big, investment-worthy difference lay was in that the users could bring themselves to believe that the notional menace of the flimsy rubber sac had been abolished from the pen. There was still a flimsy rubber component, which differed from the sac mainly the way it was applied to the pen. This is, of course, rather disingenuous, since calling the thing a “diaphragm” doesn’t really change its underlying nature. 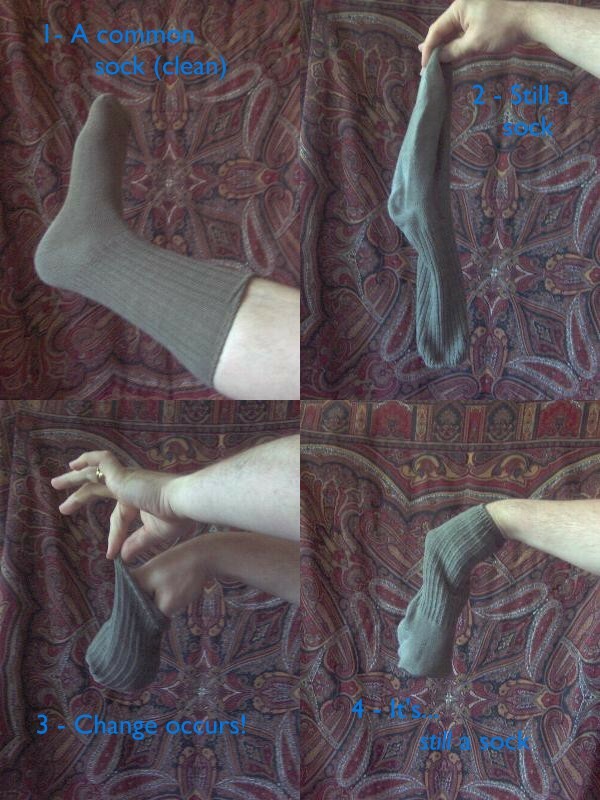 Consider: if you hold the toe of a sock between thumb and fore-finger, then pull the cuff of it over your wrist, you have a model of the Vacumatic filler, and you also have, still, a sock. What won’t I do for an analogy? The real advantage of this filler over Parker’s sac-based button filler lies in other attributes shared with the bulb filler. There is rather less non-ink material cluttering up the inside of the pen’s barrel, so more ink can be stored and a longer period of writing between fills is possible. There is also the possibility of seeing the ink, since the barrel acts as the reservoir and the common barrel material of the day, celluloid, can be made clear; the mystery of how much ink remains in the pen is abolished! 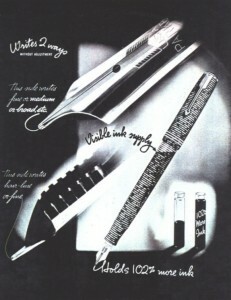 Part of a 1934 advert for the Vacumatic. Doesn’t it seem like it was worth a king’s ransom in R&D? The pen that introduced this filler was initially called the Golden Arrow, and then the Vacuum Filler, before finally settling into being the Vacumatic in 1934. This name was definitely a product of the age, in which anything wishing to be seen as smart and forward-looking tended to find a “-matic” in its name, much as the 1980s saw “-tron” sprouting all about. The pen displaced the Duofold at the head of Parker’s heirarchy, and would remain there until the appearance of the “51”. The filler would stay at the top of the heap until 1948 and the appearance of the Aerometric “51”, and it would also spread downward, showing up in some versions of Duofold. As was the case with most of Parker’s pens, there were many sub-variants by size, and a diversity of colours. 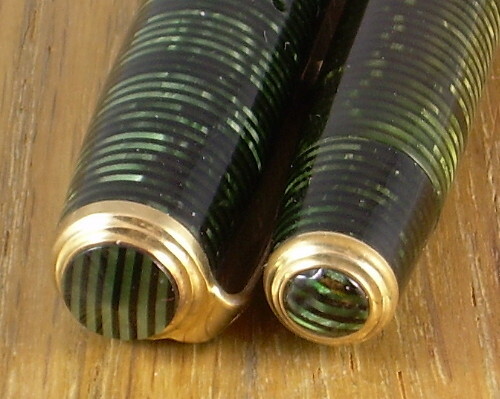 The most common pattern for the barrels is alternating layers of clear and pearlescent celluloid. Over time, there were also changes. Externally, the clip was initially a slender art deco arrow, which was replaced by a slightly more baroque “split arrow” with the maker’s name and the blue lozenge of quality on it. This lozenge does not, by the way, appear on all Vacumatics of this age, as there were some economy models without.. If the buyer was willing to forgo the dab of paint and the full warranty, they could have the pen for less. For example, the post-1942 Major and Junior models have no difference beyond this repair policy. At the other end of the pen, a tail jewel and tassie echoed the trim on the clip; this went by the board in 1942 in favour of a simple rounded end on the blind cap. The filler changed over time as well. The stem in its first form locked in the down position. This allowed the blind cap to be relatively small, as it had been on the button-filled pens, but it also required a deal of extra machining of the filler and stole some capacity from the inside of the pen. In 1937, production began to switch over to a “Speedline” filler which could not lock in place. To keep the longer blind cap from making for an oversized pen, the barrel length was somewhat reduced, so there was no real gain in ink capacity; in fact, the change slightly reduced capacities. In 1942, in response to wartime restrictions of materials use, as much of the filler as was possible was replaced with plastic, including in some cases the threaded collar holding it into the barrel. After the “51”s introduction, the Vacumatic remained in Parker’s stable until 1948… or so. Production carried on in Canada, which tells us something about either the inherent conservatism or the inherent dandyism of Canadians, so it is possible to find a Vacumatic from as late as 1953. In writing, there is little to beat a Vacumatic. Points tend to be firm rather than flexible, but that aside they’re hard to beat. As noted in the ad above, the point allows inverted writing with a finer line. This is actually something most fountain pens will do, but Parker made an advertising point of it, and also applied some effort in the grinding so the inverted use would be consistently smooth. Cost When New: The first year models were $7.50 or $10.00. The 1941 catalogue shows $10.00 for the Maxima, $8.75 for the Major and Debutante, and $5.00 for the Junior and Sub-deb. These prices remained stable until at least 1945, and probably until the end of production in the US (for modern values, try this calculator). Standard, lockdown filler (1933 – 1938): 13.1 cm capped, 15.2 cm posted, 12.0 cm uncapped. Junior, lockdown filler (1933 – 1938): 12.3 cm capped, 14.7 posted, 11.8 cm uncapped. Debutante and Sub-Deb, speedline filler (1939 – 1941): 11.9 cm capped, 13.7 posted, 11.0 cm uncapped. Major and Junior, plastic filler, single jewel (1942 – c.1953): 12.7 cm long capped, 14.7 cm posted, 11.7 cm uncapped (not definitive since there is small individual variation). Point: 14k gold, in some models plated with a platinum mask. Filler: Vacumatic, capacity approx. 2.2 ml in the Standard, 1.9ml in the lockdown Junior, 1.4 ml in the Major– you may compare this to the similarly-sized Challenger’s capacity, and ponder the 102% improvement offered in the preceding ad. 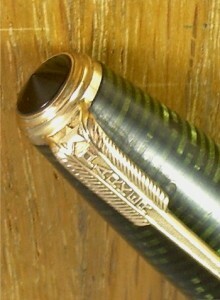 Parker Vacumatic Standard, silver pearl (slightly ambered), 1936 model. Notice that this earlier model has a section and jewels which match the body. Vacumatic Standard in Emerald Pearl. Probably 1937 or 1938, but the impression is polished away; the point is 1937 production. Detail of the colour-matched tail and cap jewels; pretty, but a misery if one goes missing. Vacumatic Junior, late 1937. This pattern is “Transparent Burgundy”, as the dark bits can actually be seen through, and this was the last year this colour would appear. Vacumatic Junior in Brown Shadow-wave pattern, a lock-down with a very late 1939 date code. Brown is how the catalogue described it; most people would call it gold. Vacumatic Sub-Deb in Emerald Shadow-wave. It bears a date-code for the first quarter of 1941, and is fitted with a Speedline filler. Vacumatic Junior, Azure Blue Pearl, c. 1942 (the date code is effaced on this example). There is no blue diamond on the clip; this, the difference of band, and an unplated point appear to be where the saving lie vs. the Major. Parker Vacumatic Major, silver pearl, 1942 model with matching pencil. This colour was the only one with chrome rather than gold trim. Note that the mask hasn’t been polished from the point, so only the arrow looks gold. Parker Vacumatic Major, 1945 model, black. This was the first one I got, and for a wonder the filler was still functional when I got it. The transparent bits are a sort of beer-bottle amber, which is about average for these pens. 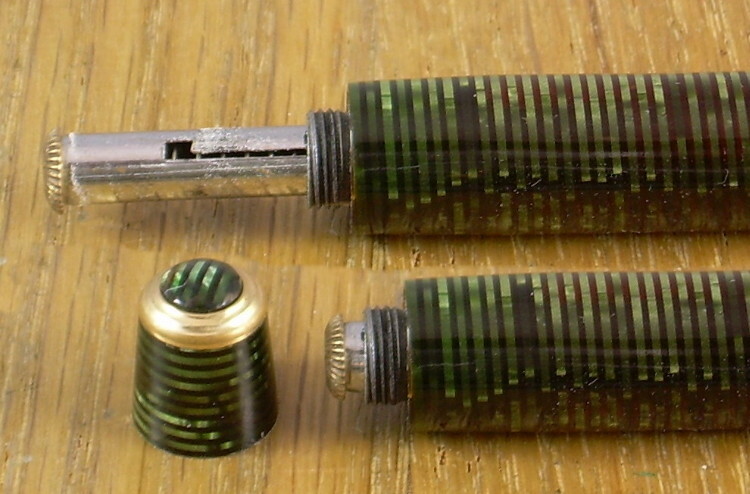 Vacumatic Major, green pearl, Canadian 1949 production. They’ve stopped painting in the blue diamond. The same, backlit to show reasonably good clarity. On a perfect example, the clear bits have almost no colour whatever.